Our goal at SixEight Church is to live our lives out of the overflow of our hearts. So, we are starting a new podcast. Our goal is to resource you where you are. 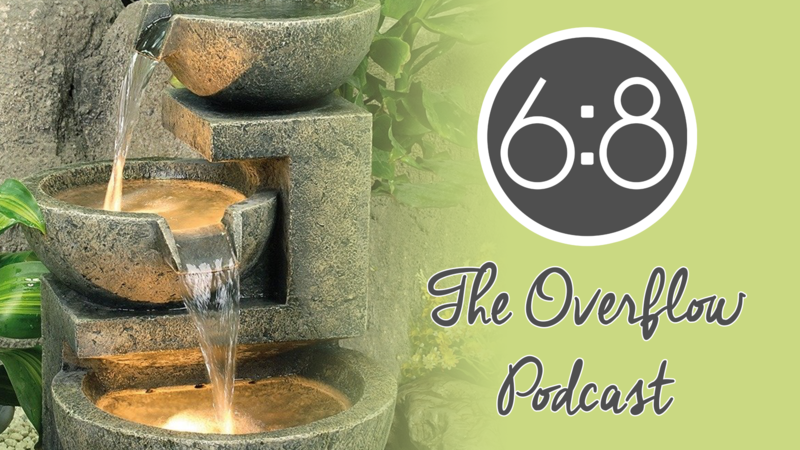 We want to help you live out of the overflow in you day in/day out life. To do that, we’re going to be trying to push out different kinds of content for your daily walk. Not just more sermons, but shorter applicational thoughts, discussions, etc. Episode 0001 is just that, it’s about loving God with all your heart. The only way for us to live out of the overflow, is if we first receive God’s love. Heart = Motives, affections & feelings. Strength = Actions & Behaviors. We hear the word obedience and command and immediately, our minds go to loving God with all our strength. What I mean by that is, when we hear Jesus say, “If you love me, obey my commands” what he must mean by that is the doing, the actions and behaviors, the strength. And, while that is part of it, it is only a part, but not even the first part. So, where do we begin? We begin with the heart. Love God with all your heart. Love God with your motives. We ask the question, what is the why that drives your life? For most of us, we are the why. I am the reason for living. I want to get what I want. I want to do what I want to do. Likewise for most of us, our affections are based around ourselves. What we love are the things that “make us happy.” Similarly, our feelings are our response to how others affect our happiness which is based on ourselves because everything is about us. Truthfully, it’s quite the opposite. The love of God is not something we can earn. We cannot, by our actions, impress God to the point where He loves us. Neither can simply have the correct thinking and understanding about God get us to God or get His love. Similarly, we can’t just make God the motive of our lives, the thing we love and try to force ourselves into feeling like we love him. Hear this truth: You are not trying to earn approval from God like you are from a disapproving parent. He gives it freely, all we have to do is freely receive it. The love of God CANNOT be earned by acts of righteousness (strength). If it could, there would have been no need for Jesus. Neither can the love of God be defeated by our lack of righteousness. If it could, our sin is stronger than God’s love. Don’t worry, it’s not. This is a work that can ONLY begin with God. And all we can do is receive it. Have you started there? Are you starting with receiving your gift from God? Do you feel like you keep trying harder and harder, but always come up short? You’re probably starting in your own strength. Do you feel like you keep trying harder and harder to “renew your mind” and think the right thoughts and have the right beliefs, but somehow, you keep coming up short? You’re probably trying in your own mind. Do you feel like you try hard to love God, to worship God to feel like you’re in love with God, but it’s just never there? Then you’re probably trying in your own heart. Don’t do that. Stop it. That’s not the life Jesus died to give you. He died to give you a new life and a new heart. He didn’t die to correct your behavior, your thinking or your feelings. He died to give you an indescribable gift. And once you’ve received it, it changes everything about you. It changes your feelings, affections and motives. And when God’s indescribable gift changes that, it changes your thoughts and beliefs. And when God’s love changes that, it changes your behaviors and actions. And you’ll find yourself, because of the Joy of your salvation doing and thinking and feeling in ways you never thought possible. Because, in your own strength it never was and never will be.